Cushion Cut Ametrine Gemstones in Grade AAA Grade AAA cushion cut Ametrine gemstones are a medium purple and medium golden yellow (lighter than image displays) with good color separation and have a eye clarity rating of eye clean plus. 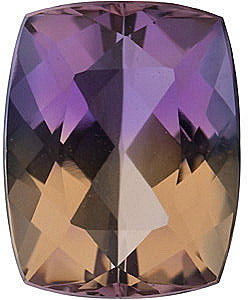 Ametrine gemstones are subjected to traditional heat treatment and are sourced from Bolivia. The gemstone known as Ametrine comes from the combination of the word Amethyst and Citrine. Ametrine gemstones are a quartz gemstone, and quartz crystals that are found with both the colors of Amethyst and Citrine are called Ametrine. Typically cut into rectangular shapes such as emerald or cushions which best display the beautiful lavender purple color of Amethyst and the golden yellow color of Citrine. It can also be faceted in a way that blends the two different colors into very interesting patterns throughout the gemstone. 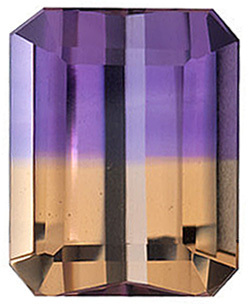 Ametrine is sometimes called bi color quartz as well. Because of our vast inventory of calibrated Ametrine gems, we have the ability to perfectly match Ametrine for you at NO CHARGE. Just click the Matched option box and we will do all the hard work to perfectly match up the stones for you in terms of size, color and cut. Guaranteed! Ametrine is actually a rare gemstone considering that 99% of the commercial production is from one mine in the entire world. 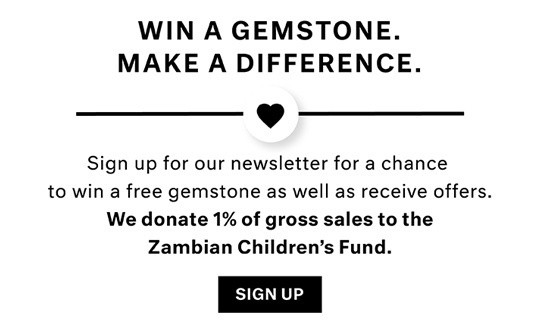 Considering how inexpensive the gemstone is, this is quite an amazing fact. Ametrine is mined from the Anahi Mine in Bolivia. This Ametrine mine has been known for centuries as has the Ametrine which was introduced to Europeans by the conquering conquistadors of Bolivia. 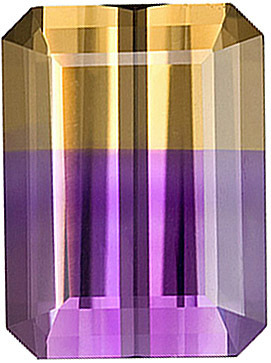 As a quartz gemstone, Ametrine is very durable and hard and is suitable for any kind of jewelry. Ametrine is also quite popular with gemstone carvers and special lapidaries which turn these special bi colored quartz gemstones into true works of crystal art. All of our small sized Ametrine gemstones are backed by our exclusive 100% refund policy and have a 30 day return policy.